“The Queens Museum of Art proudly presents Panorama: The Mapping of Prediction, an exhibition of Stephen Talasnik’s architecturally inspired drawings, on view September 28 through November 30. Including thirteen pieces from Talasnik’s Panorama series, measuring up to twelve feet in length, the exhibition captures his trademark use of architectural forms, transforming the monolithic into the intimate, and the structurally complex into the fantastical and futuristic. Installed in the same space as the Museum’s Panorama of the City of New York, built as the world’s largest architectural scale model for the 1964 World’s Fair, the exhibition presents Talasnik’s own musings on architecture and design juxtaposed with the model that inspired his artistic career. In 1964, among the millions of people who flocked to Flushing Meadows Corona Park for the World’s Fair, was Stephen Talasnik, then a nine year old boy from Philadelphia. There, Talasnik was exposed to a temporary city of pavilions with modern architecture, a futuristic monorail connecting them and a vision for what the coming decades would hold. It was this experience that sparked Talasnik’s fascination with futuristic design and in turn has fueled an artistic career that has evolved to reflect inspiration from da Vinci’s inventions and Piranesi’s didactic wonders, to Hugh Ferris’ skyscrapers and St. Elia’s transportation centers. Originally from Philadelphia, Stephen Talasnik attended the Rhode Island School of Design and the Tyler School of Art, including a year of graduate study through Tyler in Rome. His early interest in drawing was inspired by visionary architecture, specifically the work of Hugh Ferris, Antonio St. Elia, the Italian Futurist, and Georgi Krutikov, an architect of the Russian avantgarde. Industrial designers Raymond Lowery and Norman Bel Geddes also informed his work, and as a student at RISD, Talasnik studied black and white theory with photographers Harry Callahan and Aaron Siskind. He received a National Endowment for the Arts grant that enabled him to return to Italy where he started a series of architectural predella drawings. 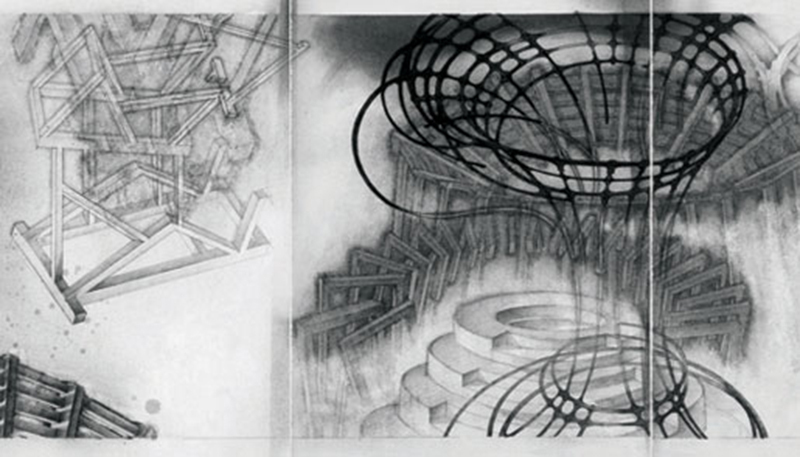 The panorama drawing series was started when he was living in Tokyo. After his Japan experience, he moved to New York City although he exhibited primarily in Europe and Asia. More recently, he has started to make wooden and bamboo sculpture inspired by the linear infrastructure associated with intuitive engineering. Talasnik’s drawings and sculpture have been exhibited internationally and are included in numerous public collections including the Albertina, Vienna; British Museum, London; Canadian Centre for Architecture, Montreal; National Gallery of Art , Washington DC; Staats Galerie Berlin; Staats Galerie Stuttgart; and Stedelijk Museum , Amsterdam. Stephen Talasnik lives and works in downtown Manhattan. Additional info and images. Stephen Talasnik, PANORAMA: The Mapping of Prediction is supported in part by the New York City Department of Cultural Affairs and the New York State Council on the Arts. The exhibition is organized by the Queens Museum of Art. Special thanks to Marlborough Gallery.